Christmas is almost upon us and I’ve saved a special seasonal beer for my last beer review before the big day—Christmas Ale by St. Bernardus Brewery in Watou, Belgium. As beer geeks will know St. Bernardus brewed the beers of the Trappist monastery of St. Sixtus in Westvleteren from 1946 to 1992, using the recipes and yeast strains from the monastic brewery. In 1992 the monks decided not to renew the license and the highly sought after Westvleteren beers, such as Westy XII (the highest rated beer in the world on RateBeer.com) are now made at the monastery, while the secular brewery in Watou continued brewing many of the same beers but was rebranded as St. Bernardus. So among Christmas beers no other beer can trace it’s lineage to a Trappist brewery like St. Bernardus Christmas Ale. I first encountered this beer two years ago and my tasting notes from then say “the best Christmas beer I’ve ever had”. I’m not the only one with that point of view, this year it topped Paste Magazine’s list of the 15 best Christmas beers. However, last year I bought a four pack of 11 oz bottles and I have to admit it did not live up to my expectations. I saved one bottle from that four pack and kept it in my basement closet for the past year. That is the bottle I’m reviewing today. 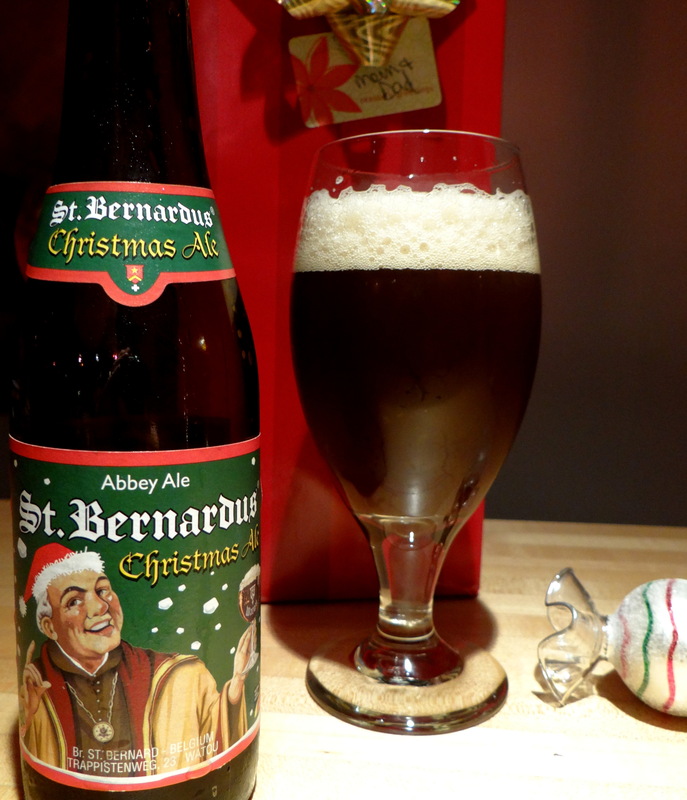 St. Bernardus Christmas Ale is a dark seasonal brewed in the classic ‘Quadrupel’ style of Belgium’s best Abbey Ales. (10,0 % ABV) Similar to all the beers from our brewery, it greets the drinker with the signature aroma of the St. Bernardus house yeast strain (in use since 1946!) Rivaling the complexity of the St. Bernardus Abt 12, St. Bernardus Christmas Ale offers a spicy, mint-like flavor profile exuding the tastes of warming alcohol, fermented molasses, apricots, licorice and marzipan that are highligted by the perfect balance of brewing sugars. On the back label there is a date of 24-7-18. According to the Fresh Beer Only website (a very handy site that catalogs the freshness labeling on beers) St. Bernardus labels their beers with a best before date that is 5 years after bottling. Therefore, this beer was bottled on July 24, 2013 and is 1 year, 5 months old. A bit of foam slowly emerges from the bottle on opening, not enough to be a gusher but enough to let you know the yeast used for bottle conditioning has been at work. Quickly transferring to a glass I see that it has a hazy walnut brown color and a big head of cream colored foam that initially fills nearly half of the glass. Holding it up to a light source reveals suspended matter that scatters much of the light, but plenty of honey brown highlights stream through the edges. The head dies down reasonably quickly and over a few minutes I’m able to get the entire 11 oz bottle in the glass. For the amount of head that formed on pouring the lacing is pretty modest. The beer greets your nose with a mixture of brown sugar, dark fruits, and a touch of booze. The taste follows suit, sweet bready malts at the fore intermingled with flavors of plums and dates dipped in molasses and rolled in brown sugar. I don’t perceive any of the spices one normally associates with Christmas beers (cinnamon, nutmeg, ginger, cardamom, …), if they are present they are very subtle. It’s obviously caloric and sweet but I don’t find it to be cloying. The alcohol is not terribly apparent in the flavor, but as the sweet liquid slips past your tongue a warming sensation wells up from deep in your throat and lingers for some time. The mouthfeel is thick and rich, but at the same time quite carbonated. It’s a little too carbonated for my liking if truth be told. Like a Christmas plum pudding in liquid form, St. Bernardus has produced a dessert leaning beer that conjures the spirit of the holidays. Having said that not everyone enjoys plum pudding and for me this beer is a little too sweet. Somehow it lacks the elegance of the best high abv sippers, and while it’s difficult to pinpoint the reason why I suspect the malts are too bready and the carbonation a little too high for my tastes. I guess I was too effusive a couple of years back when I declared this the best Christmas Ale out there, still it is a style of Christmas ale that is quite different from most of its American counterparts and well worth a try if you have a chance. Now I’m curious Pat, what is now the best Christmas Ale in your opinion? I have a hard time getting into this style. Most of the beers I’ve had are two sweet or overly spicy. Sierra Nevada’s Celebration Ale is a holiday beer I look forward to every year, but it is really just an IPA so I would not call it a proper Christmas Ale. Of the spiced Christmas beers I’d probably say 4 Elf by Dark Horse Brewing. It’s got a nice chocolate malt flavor that goes well with the cloves and nutmeg. For a high abv winter sipper with a holiday theme I’d have to say Troeg’s Mad Elf. That’s quite a nice beer. Thanks for the suggestjons. Troeg’s just started distribution in North Carolina so I will check out Mad Elf.